Photo taken at the usual Huddersfield bus stop and this buses destination is Dewsbury. The Willowbrook body is very similar to the previous Marshall bodied buses that have been seen on this site or should I say it the other way round as this bus is older than the Marshall ones here and here. 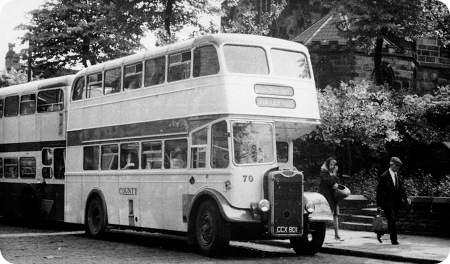 From 1927 County motors were jointly owned by Yorkshire Woollen District, Yorkshire Traction and West Riding Automobile but in October 1968 they were absorbed into Yorkshire Traction and this bus was re-numbered 392 in there fleet. Another County Motors of Huddersfield vehicle this time a Leyland Titan PD3A/1. The PD3 indicated that the bus was 30 foot long rather than 27 foot of which all the PD2s were. The A after the 3 indicates an enclosed radiator made mainly of fibre glass and this style was introduced after consultation with St Helens Corporation. The 1 after the 3A indicates that the gear box was of the normal synchromesh type rather than the Pneumo-Cyclic direct selection type. 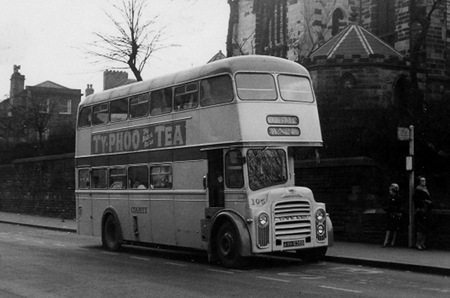 County Motors were taken over by Yorkshire Traction in 1968 and this bus became fleet number 745 with them. There is a photo of this bus in the Yorkshire Traction livery here unfortunately it seems to have lost the bottom half of its radiator. A full list of Titan codes can be seen here. Re the comment about the radiator grill. These were only a fibreglass moulding and were prone to being broken – for example by conductors standing on them to change the destination. Yorkshire Traction simply modified them when necessary by substituting a mesh panel instead. Handsome indeed – but they were traditional Roe bodies! Yorkshire Traction only ever had three batches of PD3s from new. The first two Northern Counties, the last the Roes (on Park Royal frames) – which still managed to look better proportioned than the almost identical contemporary Sheffield Regent Vs with "real" Park Royal bodies. 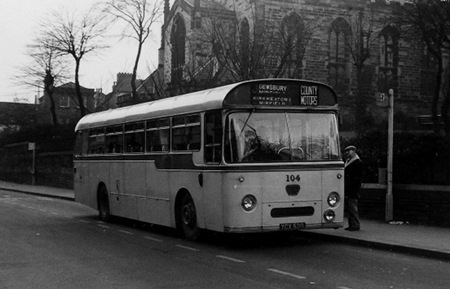 The only Willowbrook deckers in the fleet were the RHE…G registered Atlanteans which were a diverted order from Devon General, delivered initially in Devon General livery. David, I seem to remember that there were four of the diverted Devon General Atlanteans. They appeared very frequently in Leeds on the Yorkshire Traction services and I found them fascinating. The colours were most pleasing and, although I never rode on one, I have an impression that the interiors and the seats were in blue – can anyone please confirm this ?? I think you’re right about the numbers, Chris, and almost certainly about the interiors. Blue was the then standard for Devon General. Prior to nationalisation, Devon General was a superbly presented fleet and the difference in shades of red and cream between Devon General and Yorkshire Traction made an interesting comparison. This photo was taken at the Huddersfield terminus and the bus behind is a Guy Wulfrunian probable owned by West Riding. The Wulfrunian was said to be very advanced for the time, but I have read somewhere that the only advanced thing about it was the all round air suspension, lets face it the rather strange layout of the engine and stairs didn’t exactly catch on did it, if you disagree leave a comment. But back to the County Motors Arab II this bus apparently has been preserved but at the moment I have not been able to come up with a link to a dedicated website, if you know, let me know. It started life with a wartime utility body but was re-bodied in 1953 by C. H. Roe Leeds and ended up two seats less at the end of it. Hard to tell which engine this bus had as all Arab IIs had the extended radiator to accept either the six cylinder Gardner (6LW) engine of 8.4 litre or the shorter five cylinder 7.0 litre Gardner (5LW) engine. Although knowing Huddersfield as I do then I think this bus would of handled the surrounding hills much better with the larger 6LW engine, either that or the driver would have to be very good at changing gear, especially down. “Anything—pictures or info—on Guy Arabs is fascinating. Greatly enjoyed pictures and comments.